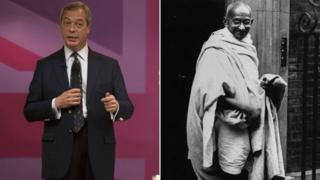 UKIP leader Nigel Farage has compared his battle against the UK political establishment to Mahatma Gandhi's struggle for Indian independence. He told supporters at a rally in Kent: "I am challenging the establishment, I am taking on the status quo." He said anybody who had done that throughout history had been attacked for their beliefs. Quoting Gandhi, he said: "At first they ignore you, then they laugh at you, then they fight you, then you win." In his speech at Sandwich, Mr Farage said UKIP had endured levels of abuse that "don't generally get thrown at political parties". "But then again I am challenging the establishment aren't I?," he told supporters. "I am taking on the status quo. I am taking on their very, very comfortable lives. "But if you look through history anybody that challenges the status quo, whether in business, science or politics, they have a go at you. "And it was Gandhi, of course, who said 'first they ignore you, then they laugh at you, then they fight you and then you win'." The quote, which was delivered with a smile, rounded off Mr Farage's speech and he repeated it later during a question and answer session. It is one of the most widely quoted of Gandhi's maxims, summing up his philosophy of "insistence on truth" that underpinned his belief in non-violent resistance. But according to the Christian Science Monitor, there is no evidence that the civil rights campaigner ever said it.